Throughout the month of April I have been working with Bedford Creative Arts, collaborating and responding to the work of artist Arabel Rosillo de Blas. Arabel has been reseaching the history of Bedfordshire Lace and making a series of works and events around this. Whilst I was at BCA, Arabel was working with local people on an enormous task – to lace a building in the centre of Bedford! 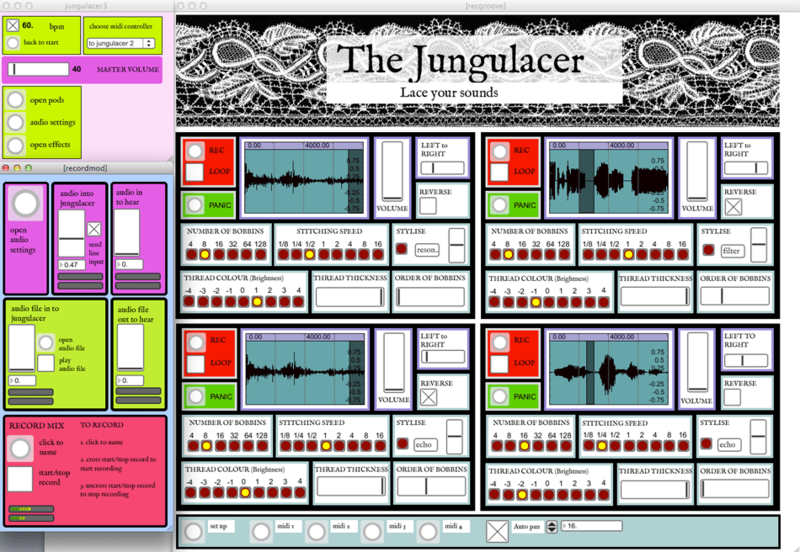 I then collaborated with Matthew Olden, aka i am the mighty jungulator and he designed a really fantastic adaptation of part of his Jungulator software – called The Jungulacer. Workshop participants could then play with music box composition and ‘lace the sounds’ using the jungulacer, adding more complexity to the soundworld by chopping, reversing, repeating, re-pitching samples from their short piece. 1 May, 2012 | Filed under News, Talks / Lectures and tagged with audio-visual, Jungulacer, workshop.